The Joker is coming to Six Flags New England in 2017! The Joker will be taking over Six Flags New England in 2017 with an all-new 4D Free Fly roller coaster! Six Flags New England, the Coaster Capital of New England in partnership with Warner Bros. Consumer Products on behalf of DC Entertainment today announced plans to add its 13th coaster to the park, The Joker: 4D Free Fly Coaster. This unique coaster experience will feature theming based on the iconic Super-Villain The Joker and be located in the park’s South End. After being lifted straight up a 120-foot hill, this 4D Wing Coaster challenges riders to “face their fears” as they flip head-over-heels from four to eight times along the weightless, tumbling journey. Along the way on this 4th dimension free-fly coaster, thrill seekers experience exhilarating coaster hills and unexpected drops along with an interactive ride experience, making it a different sensation each time guests ride. The Joker: 4D Free Fly Coaster allows adrenaline seekers to soar outside the confines of the track for an all-new coaster riding experience. “We are thrilled to launch our 13th coaster here at the Coaster Capital of New England. Not only does The Joker: 4D Free Fly Coaster utilize the latest innovative technology, it is highly interactive and will deliver something new for every rider. This is a great complement to our existing ride offerings and should be quite a hit with thrill-seekers. The unpredictable tumbling will add a new element as riders travel along the plunging and swirling track,” said Park President John Winkler. The Joker: 4D Free Fly Coaster features a massive and twisting track frame, in which ride vehicles begin their journey by traveling up a 120-foot elevator-type lift before being released for their highly unusual sensory journey – including two beyond-vertical free falls, in addition to four to eight head-over-heels flips. 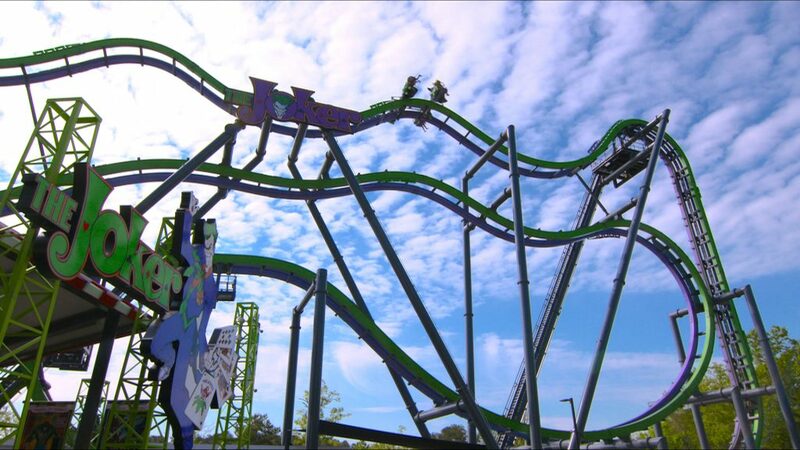 The Joker: 4D Free Fly Coaster is one of the most exciting thrill rides in the park’s history. Five vehicles with eight passengers each. The Joker will be replacing Splash Water Falls in the South End section of the park. Besides it being an exact clone of Six Flags Great Adventure’s newest coaster, it will be a great fit for our park. The new coaster will likely open around Memorial Day weekend. Stay tuned to our website for all of the latest construction updates and news regarding Six Flags New England. Be sure to follow us on Twitter and Facebook for more up-to-date updates. Next story New for 2018 at SFNE – Harley Quinn Spinsanity ! Six Flags New England Announces : Pete Carmichael to return to the Park as Park President ! New for 2018 at SFNE – Harley Quinn Spinsanity !